Oneness or Unity is the most important cosmology you will ever understand. It can be summed up in the simple statement, God is all there is. Take a moment now and reflect on the meaning of this. Oneness is all inclusive and very simple; however the reality in this ego world is separation struggles to maintain a hold on life. Ego demonstrates thru turmoil, conflict, hate, fear, loneliness and death. The only way to move beyond the illusion of separation is to embrace it; to see it for what it is; an illusion. When something comes up you recognize as separation, simply acknowledge it, see beyond it and then just leave separation behind. Ignore it, it has no power. Instead focus on the Truth. The Truth is we are One unified and whole being. We are Gaia! Oneness is Unity expressed, it is love thy neighbor as thy love’s oneself, it is making decisions with the consideration of seven generations to come, it is knowing we are all made of ‘Starstuff’, and it is so much more. Oneness is the realization that everyone you meet is a part of YOU, and you are Great Spirit, Universal Intelligence, or God. You have this in common with everything as well as everyone you meet. They are you and you are they. Each person is individual and connected at the same time. What you give, you give to yourself, since we are all one. What you deny for another, you deny yourself. What you say about another you say about yourself! What comes around goes around…When you heal yourself – you heal the world! You are using the same mind as Albert Einstein or Mother Theresa. You are ONE with GOD, in a word you are GOD, expressing as the individual you are. Each form or “thing” you see is unique onto itself. No two snowflakes are the same, yet a snowflake is similar to all other snowflakes. This goes for all other forms as well, rain drops, grains of sand, trees, people, etc. And even in each moment you are different. 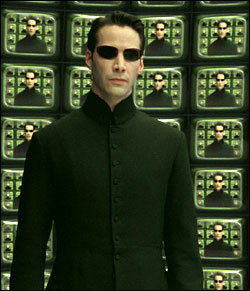 The “you” of last week is different from the “you” of now, which is depicted in this picture of Neo from the Matrix Movie. The Divine Paradox is: all is the One/Same, yet appears separate/different. When you meet someone new they are unique and yet they are YOU. When life is lived from a place of Oneness we become aware of the bond that connects all of life and things are never the same again! This dimension is the Oneness I speak of. It is something which must be experienced to truly be known, and once the connection is made it becomes a part of you and cannot be lost. By simply being aware of this Oneness you are shining light on the shadows and allowing yourself to move beyond thought into the light. On the New Earth each person is aware of Oneness and how it relates to them and the rest of existence. As we look around the realization connects – this is exactly what is happening now all over the world! People are awakening to Divine Oneness and embracing the New Earth.